Berlin, May 27, 2014 – Native Instruments announced today ARCANE ATTIC – a new MASCHINE Expansion featuring gritty field recordings. Designed for unconventional beat making across all styles and genres, this Expansion was created, recorded, and designed by BOOM Library. ARCANE ATTIC also comes with new presets for MASSIVE and MASCHINE’s Drum Synths, with a selection of sounds that perfectly complement the out of the ordinary sample material. ARCANE ATTIC is available now at the NI Online Shop and runs in the MASCHINE 2 software on MASCHINE STUDIO, MASCHINE, or MACHINE MIKRO. A compact version for iMASCHINE is also available via the in-app store. The high-quality field recordings in ARCANE ATTIC are aimed at electronic music producers or simply anyone looking to add unconventional sounds to their productions. The range of sounds is highly diverse and organized into several categories. It represents a wide spectrum from robotic and mechanical science fiction recordings to heavy cinematic metal impacts, slams, strikes, and buzzing, percussive details. A set of elemental sounds explode with kinetic fire and water blasts. Producers looking to spice up their percussion will also find a range of pistol, rifle, and cannon sounds that have been transformed into pounding drums. Finally, a set of orchestral samples recorded with a live orchestra are included for adding rich, larger-than-life melodies to productions. Complementing ARCANE ATTIC’s field recordings are a new set of 40 presets for MASSIVE, which provide additional melodic possibilities beyond the orchestral samples. 43 MASCHINE 2 Drum Synth presets feature a clean sound designed to complement ARCANE ATTIC’s gritty sample set with added punch and character. In total, ARCANE ATTIC features 7 projects, 39 drum kits, and 7 special kits, plus a set of 140 pre-arranged patterns for quick inspiration. ARCANE ATTIC was created by BOOM Library – the sound design company founded in 2010 by Axel Rohrbach, Pierre Langer, and Tilman Sillescu. The sounds are a selection from the BOOM Library product line – now for the first time directly accessible within the MASCHINE beat production environment. Their sound libraries have been featured in films like ‘Sin City – A Dame To Die For’, TV series such as ‘From Dusk Till Dawn The Series’, Games like ‘Battlefield 4’ and trailers for ‘The Hobbit – The Desolation Of Smaug’, and ‘The Dark Knight Rises’. A condensed version of ARCANE ATTIC is also available as an iMASCHINE Expansion, for creating unconventional beats on-the-go. The iMASCHINE Expansion features 2 projects and 4 drum kits. Tracks can be exported to MASCHINE STUDIO, MASCHINE, and MASCHINE MIKRO for completion. 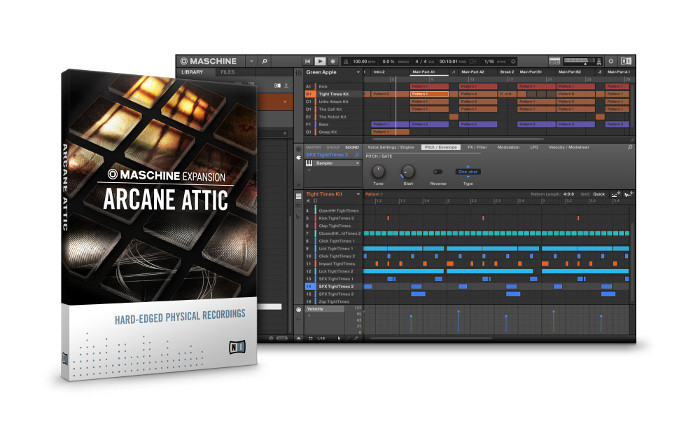 ARCANE ATTIC is available now at the NI Online Shop for $49 / 49 € / £44 / ¥ 4,800 and runs in the MASCHINE 2 software. The iMASCHINE Expansion is available at the iMASCHINE in-app store for $0.99 / 0,89 € / £0,69 / ¥ 100.